Southern Arrondissement: Miniature Giraffe! Miniature Giraffe! 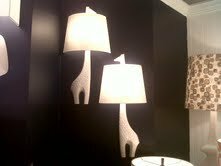 Jonathan Adler Giraffe Sconces. Love. I don't know about ya'll, but I desperately want a pet miniature giraffe. Since there's totally a waitlist for those, I'm thinking about these Giraffe sconces instead. I absolutely love these adorable sconces by Jonathan Adler, and am thinking they add a little personality to a room (hopefully my room). You can order them at Katherine's Interiors of Raleigh, $175 per giraffe. I feel as though these are a necessity for every home.